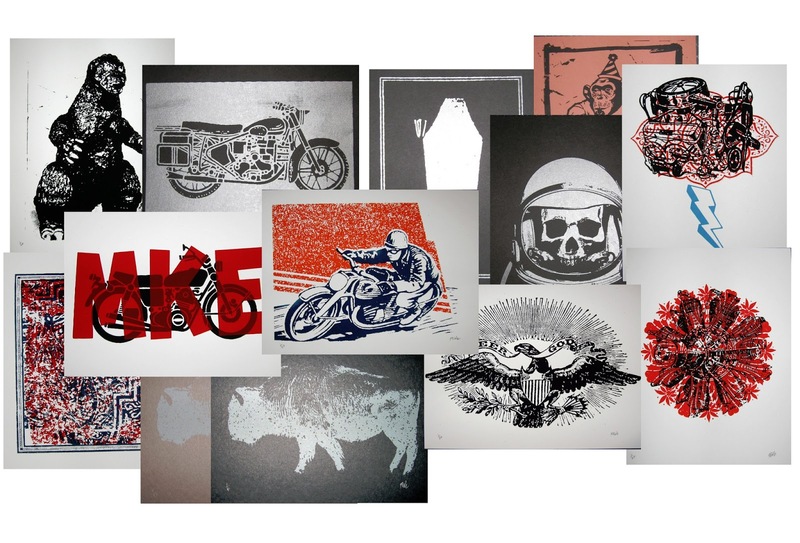 That's right, 12 new prints, of course some are of old designs. The prints are 9.5 x 12.5" in size. Shipping is only $5 flat. So if you get more than one it is still only $5. What a deal. For better images and info go HERE. 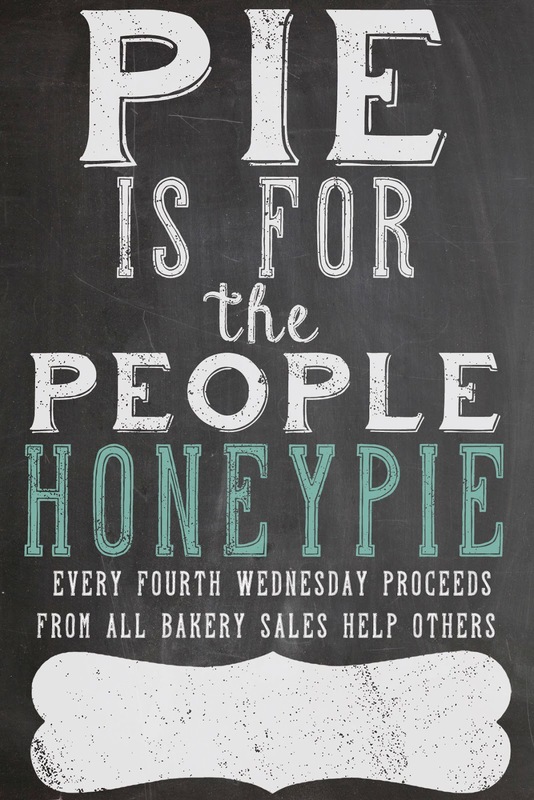 Good people and good pie. Now for a good cause. 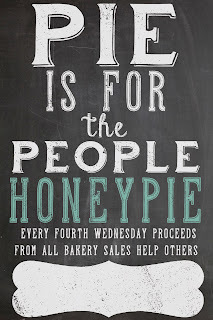 Every forth Wednesday they donate all bakery sales to different charity. trust me it's a lot of 'dough'. Now you can listen to me mumble about posters. This was done during Flatstock 38 in Austin. I trimmed my beard recently since this photo. 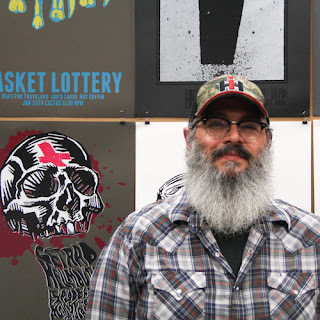 Thursday night at Hotel Foster, AIGA Wisconsin will present a night of art, film and music centered around gig posters. That makes sense; AIGA Wisconsin is one of 67 chapters of the professional association for design, especially graphic design. 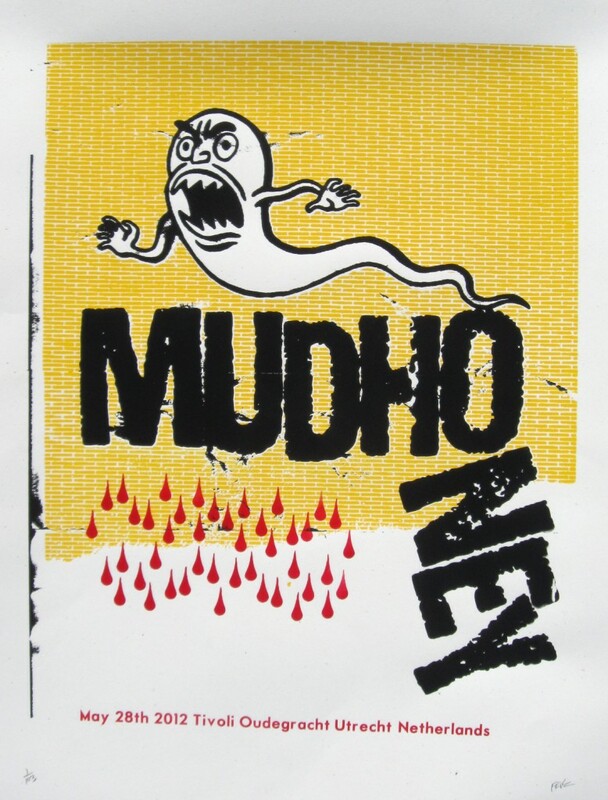 Gig posters have only recently been considered “art” in the grander sense. At the Hotel Foster, AIGA will show especially striking and creative images. The evening will begin with a meet and greet and poster sale with local artists. A screening of director Scout Shannon’s Just Like Being There, which premiered at last year’s SXSW music festival, will follow. Shannon will be available for questions after the film. Indie pop favorites Maritime — a gig poster for that band graces our Arts & Culture display page — will complete the event. Artists Francisco Ramirez and Paloma Chavez spoke on the art form and their own work. 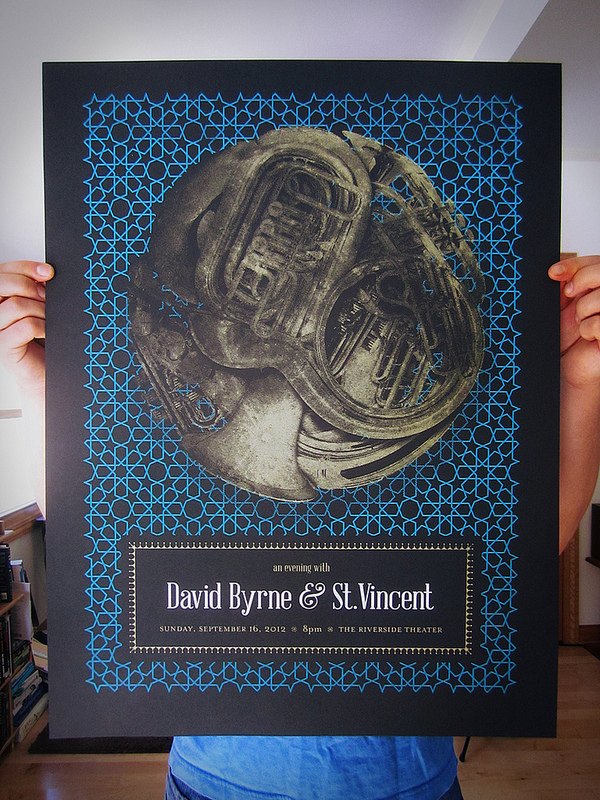 Last year, Chavez created a gig poster for the St. Vincent and David Byrne show that was turned into an official T-shirt for the tour. 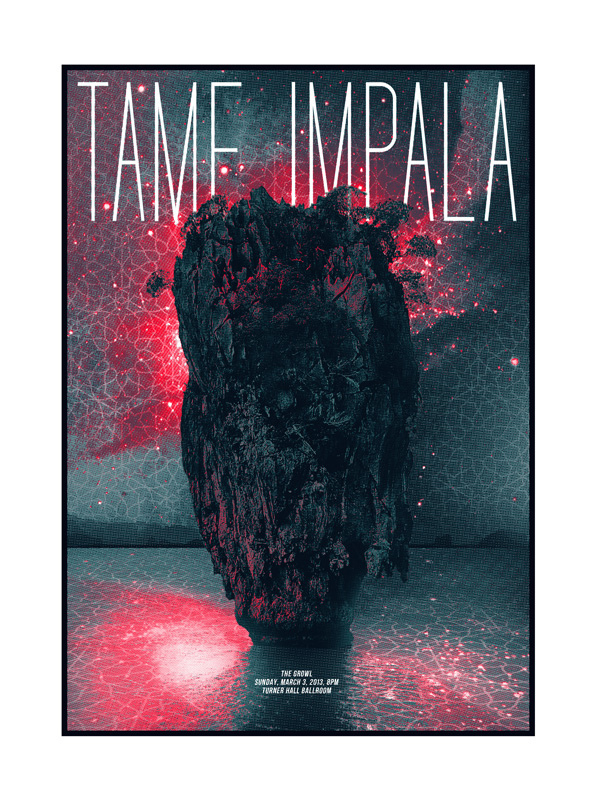 She’s also excited about her recent work for Australian psychedelic rock group Tame Impala. Ramirez started his business, The Bureau of Print Research and Design, in 2006. He also touched on the complexities of creating a gig poster. In Just Like Being There, Scout Shannon wrangled the heart and talent of the gig poster community. His film stems from his own experience in a band. Along with his musical roots, Shannon’s interests lie in the art form itself and the community of artists who create unique images. “They are an amazingly generous group of people, so almost every interview I did, I left with between 2 and 10 posters. I genuinely love the art form…I would have to live in a labyrinth in order to have enough wall space for all the posters in my collection. The Hotel Foster print event comes on the heels of the very big-deal Southern Graphics Council International Conference. Both shine light on Milwaukee’s ever-budding arts scene. This is just a straight forward punk rock show. DIY space and All Ages. Here we have a 2 color poster for Honeypie's monthly Firkin Night. This one is for Central Waters Brewing. Seems I was kinda close to their color by accident.